Churches have been instrumental in promoting art and handicrafts in Africa and elsewhere. This set of seventeen pieces of dark brown ceramic was crafted at one of the three handicraft centers run by the Presbyterian Church in Cameroon. The setting relates Christmas to Easter and underscores the rich brown coloring of the varied and expressive figures. What looks like tattoos on animals and people is in fact a tribal "business card." 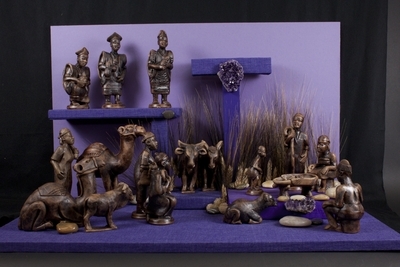 17 ceramic figures that have been glazed a dark brown, created by the artisans of Prescraft, also known as Presbyterian Handicraft Centre Cameroon. Exhibition label written by Father Johann G. Roten, S.M. originally for exhibition entitled "African Symphony" held at Roesch Library, University of Dayton.